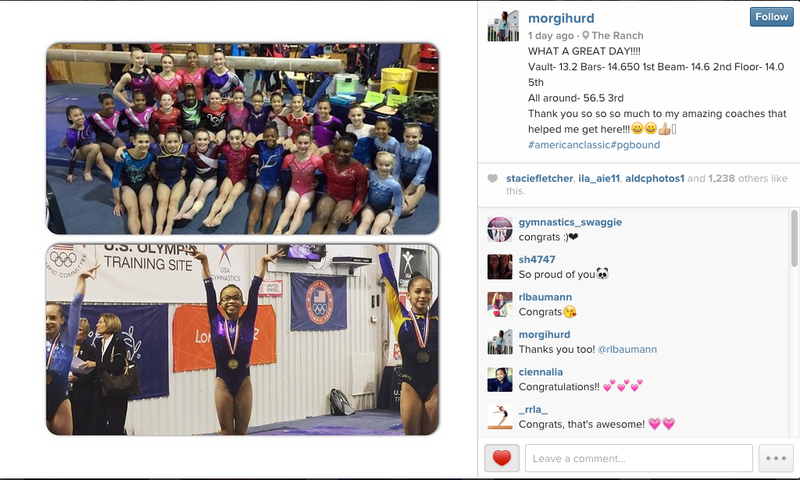 The 2015 American Classic was held this weekend at the Karolyi Ranch. The first of two qualifiers for the P&G National Championships, the American Classic is an important stepping stone for many gymnasts. The 2015 May Elite Qualifier was help in conjunction with the competition, allowing gymnasts to both qualify for elite and for nationals. Nineteen gymnasts achieved the necessary scores to qualify for nationals, either in the all-around (54 for seniors, 52.5 for juniors) or for seniors as an event specialist (a three-event score of 41.25 or a two-event score of 28.0). 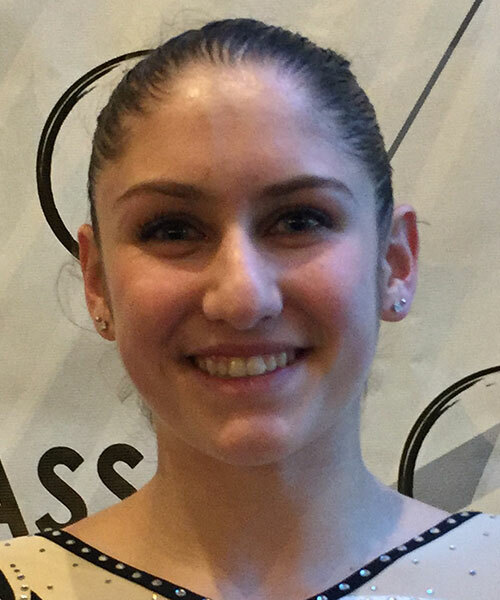 Six additional gymnasts who did not make the scores for nationals earned a high enough score (53 for seniors, 51.5 for juniors) to move on to the 2015 Secret US Classics, where they can try again to qualify for nationals. 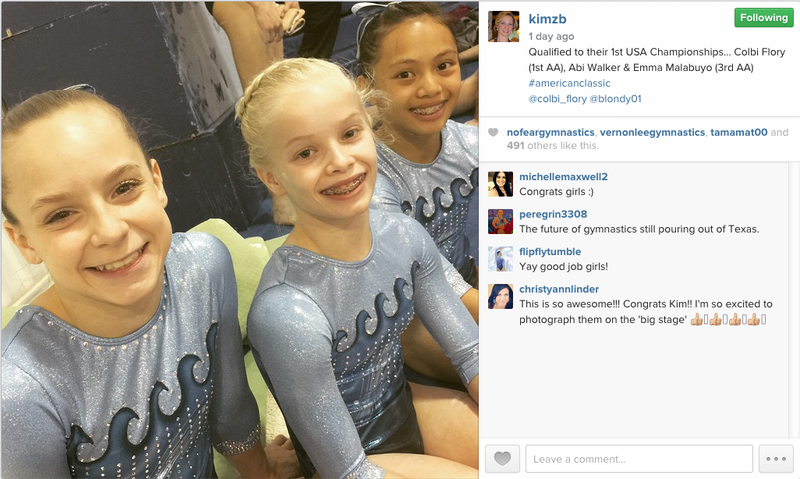 At the American Classic, Colbi Flory of Texas Dreams took the gold, scoring a 56.7. Deanne Soza of Arete scored a 56.6 for the silver. Emma Malabuyo of Texas Dreams and Morgan Hurd of First State tied for bronze with a 56.5. Pictures and posts on Instagram celebrate the achievements. Taylor Lawson took the all-around for the seniors at the May Elite Qualifier with a 53.6. Kylie Dickson of All-Olympia came in second with a 52.3 followed by Samantha Durante of Georgia Elite for third with a 51.6. Gabby Perea of Legacy Elite won all-around for the juniors with a 55.2. Kaitlin DeGuzman of Metroplex took second with a 53.2 and Alyssa Al-Ashari of Twistars came in third with a 52.75. The 2014 U.S. Classics went surprisingly without a lot of surprises for this point in the Olympic cycle and in the year. A few gymnasts brought new upgrades, but it was not crash after crash or fall after fall as it can sometimes be. Adding some of the future junior stars to the senior session was a great success, as it let many fans who don’t follow gymnastics as closely start to get to know some of the players on the road to Rio. Plus, they are just so cute! Let’s start with the seniors however. Simone Biles of World Champions Centre began her bid to defend her World All-Around title with a bang. The Secret US Classics are just a warm up meet for the rest of the season. But Biles looked ready to win another all-around and floor title tonight. Competing what is probably the best floor routine she has ever done, she started the night with a whopping 15.8. That score includes a US only sticking bonus which added .2 to her score. 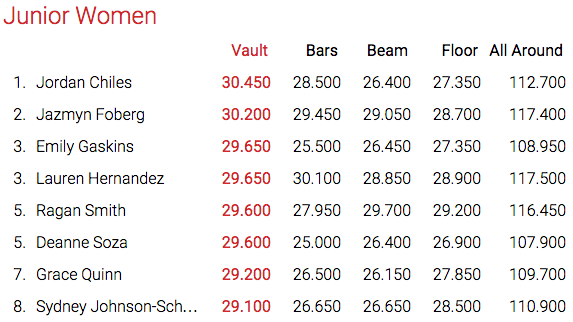 She went on to rock a powerful first vault and managed to hold on to her second vault. She had a little rough start on bars, but came through with a great routine. She ended the night with a solid beam routine and easily won the all-around with a 61.7. Maggie Nichols of Twin City Twisters took third with a 57.6. 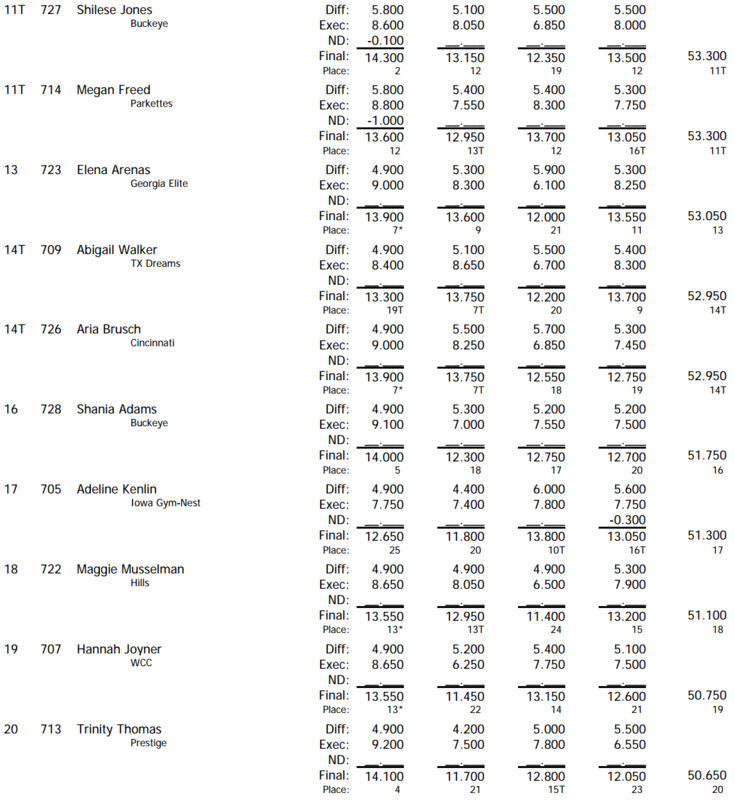 Nichols was steady on all four events, taking advantage of other athletes falls and falters. She looked clean and confident and competed very well. Rachel Gowey of Chow’s Gymnastics was very impressive. Making her senior elite debut at these Classics after being out for a year due to injury, Gowey made a splash. Beautiful long lines and the ever clean form that is the mark of all of Chow’s gymnasts made her a standout, and her difficulty on top of that make her a strong contender for this years world’s team. She fell on her amanar, but made enough of them during training that it would seem she will have the vault in time. 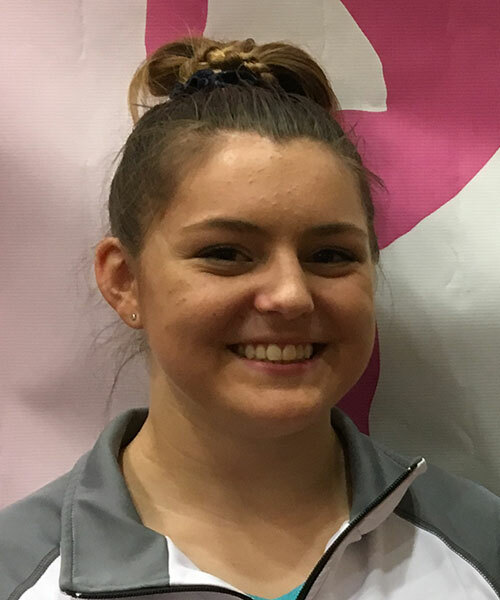 Amelia Hundley of Cincinnati Gymnastics was a junior standout, and her senior debut has been long awaited. So it was a dissapointment to many fans that she was not shown during the broadcast at all. Hundley is a steady athlete on all four event, but really shines on floor. The calm girl becomes an animated performer. Ashton Locklear of Everest Gymnastics missed most of last year with injuries. 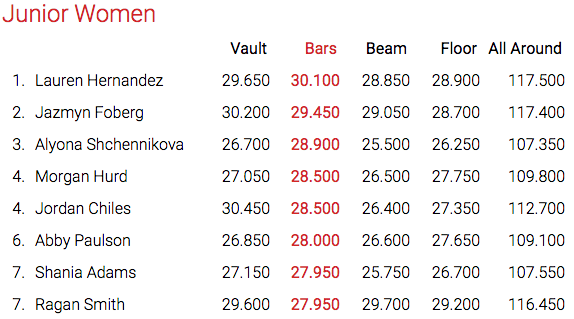 However, her incredibly clean lines and beautiful technique stood out clearly on bars. Her bars were some of the most impressive gymnastics of podium training, and brought in a huge score during the competition. Madison Kocian of WOGA began the competition first up on her best even. 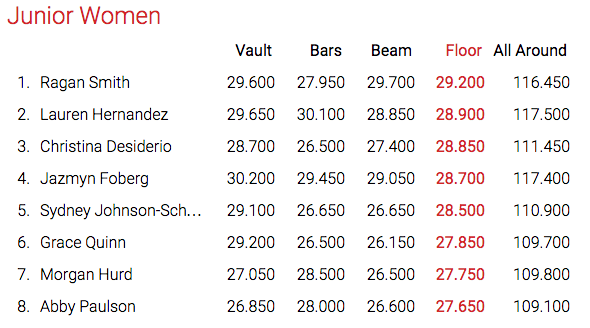 Kocian has good all-around potential, but her real spot on a world’s team will come on bars. She did not disappoint, with a clean, difficult, fluid bar routine. 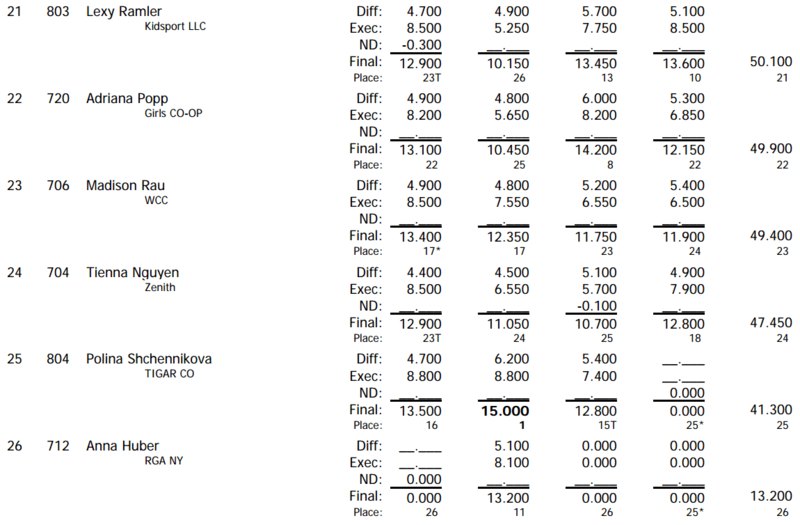 However she fell off the beam and then scratched the rest of the meet sitting on the sidelines with ice on her ankle. Fans are hoping it’s nothing serious as it was the same ankle that kept her out of competition last year. MyKayla Skinner of Desert Lights Gymnastics has been working hard to improve her execution, form and artistry. Though she has a ways to go, you can definitely see the progress. Known as the daredevil of the US, she brings incredibly difficult skills to the table. 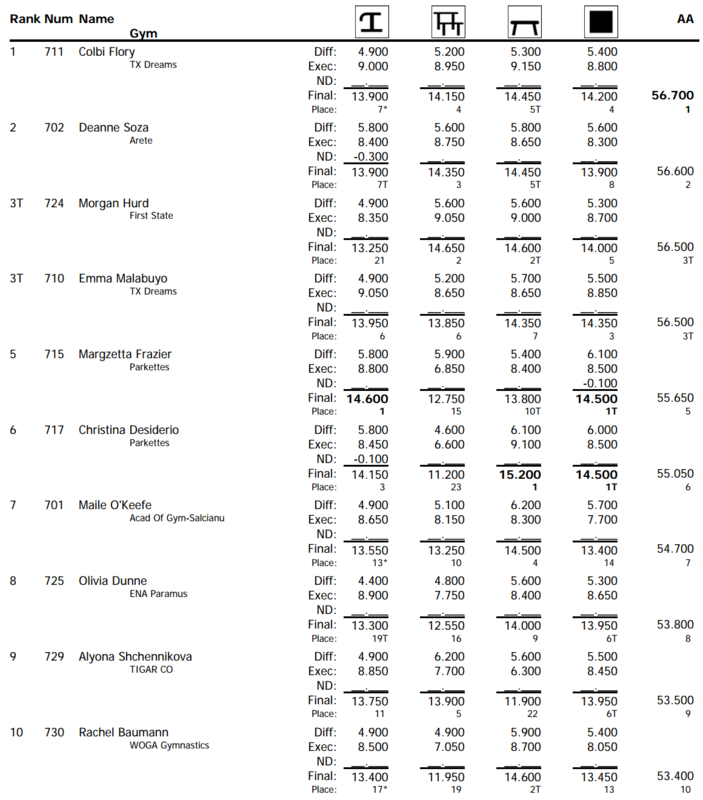 However a fall on floor and lower execution scores all around left her out of the running for the podium. Brenna Dowell of GAGE sprained her ankle a few weeks ago and only planned to compete bars at this competition. 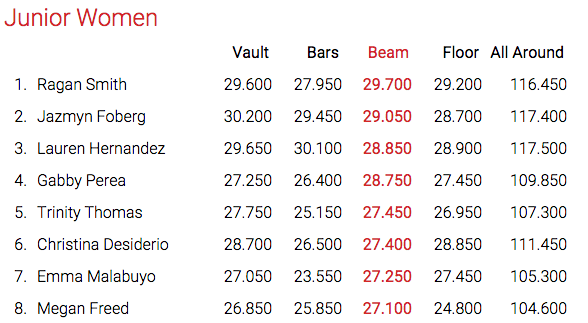 Check out the full results and watch all the routines in HD!